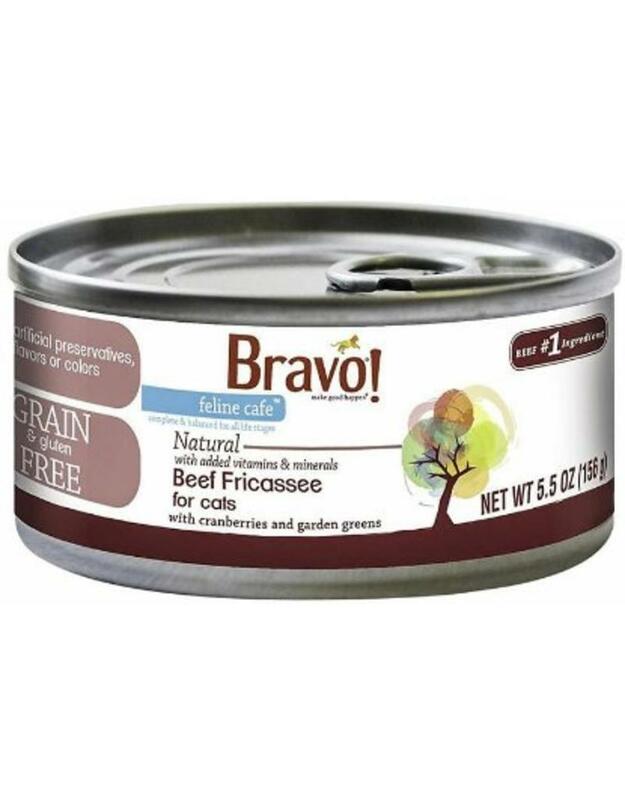 Give your feline friend they taste they crave with Bravo! Feline Cafe Canned Food! Made with added salmon oil, cranberries, green lipped mussels, garden greens and turmeric plus added vitamins and minerals to ensure that your furry friend is getting the complete and balanced nutritional diet that they need to thrive! Made with no artificial preservatives, flavors or colors and no guar, carrageenan or cassia gums and 100% complete and balanced with taurine. Ingredients: Beef, Beef Broth, Vegetable Broth, Beef Liver, Beef Heart, Natural Flavor, Dried Eggs, Sunflower Oil, Agar-Agar, Cranberries, Salmon Oil, Dried Green Lipped Mussels, Dandelion Greens, Parsley, Salt, Calcium Carbonate, Tricalcium Phosphate, Choline Chloride, Taurine, Turmeric, Iron Amino Acid Chelate, Magnesium Amino Acid Chelate, Zinc Amino Acid Chelate, Manganese Amino Acid Chelate, Copper Amino Acid Chelate, Sodium Selenite, Calcium Iodate, Thiamine Mononitrate, Niacin Supplement, Vitamin E Supplement, Calcium Pantothenate, Pyridoxine Hydrochloride, Riboflavin Supplement, Biotin, Vitamin B12 Supplement, Vitamin D3 Supplement, Folic Acid.